It's almost going to be a year that our kitchen has been completed. There are a few little things to finish. We had two walls knocked out, beams buried in the ceiling, and floors ripped up. We kept our kitchen the same size. By removing walls from the dining room and the family room, it made the whole area open and bigger. I wish this magazine was still around. I do miss them too. I would freeze the movie so that I could look at all the details of that whole house. but I must have watched it hundreds of times. I am a little crazy like that. I adore looking at how people live. I enjoy looking at old and new movies with great houses. I also love Hooked on Houses blog. You need to check it out! Lots of fun. When we decided to renovate our kitchen the easy part was to say yes to the designer. He designed the lay out. I couldn't wait to add touches to make it our own. I had all my ideas and we were on our way. The hardest part was to live in one one room for half a year. It's where we ate, played, and hung out. They say it's best to do the kitchen renovation during the summer so that you can cook outside and be outside most of the time. But I thought it would be easier to do it while the kids were in school for the most part so that we wouldn't make ourselves crazy being together 24/7. Making breakfast, lunch, and dinner was hard. We ended up eating out and lots of food delivery. Six months they said but it extended to two more months. Then there was a week that we had to stay in a hotel. The kids were excited because they had the pool to hang out in after school. I didn't mind much except for the fact that I still needed to make lunch for school (thank goodness for the small refridgerator), homework to assist without all of our gear, and to top it all off work with my son on his Science Fair project. It was fun working with the designer and watching all the improvements every week. We are happy how it all came out and it feels like it's been here forever. Here is what our kitchen looked like before. It served it's purpose. It was dark and outdated. I don't have many before pictures. I guess we never hung out in the kitchen as much as we do now. Here is when everything was gutted. Viewing it from the dining room. There use to be a wall between the kitchen and dining room. Here is another picture looking from the family room. The dining room is on the right. Another view from the kitchen to the dining room. Here is a view from the kitchen looking into the living room. Because the corridor is narrow we decided to open up the entry way to the living room. We also put speakers throught out the first floor for music. We put a speaker in the bathroom too. It's a nice conversation piece. Here is our new kitchen. We chose absolute black honed granite for the kitchen island. It's fun to entertain, bake, and craft with the kids. We chose White Supreme granite for the countertops. I love carrera marble (baker's look). I was told it would stain and with three kids it just wouldn't work for us. It took me awhile to find something similar but I think this does the job. Another view. Some areas have more gray veins. My favorite part of the kitchen is the sink area. I always wanted a farmer's sink and this was going to be the focal point of the kitchen. We went with a smaller size. in case the island was occupied. We could still cut and cook. 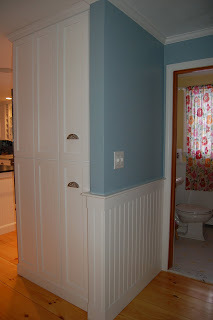 I also changed the paneling on the cabinet below the sink. We added tin pierced panels. Some of the entrances to our house we installed pebble stone tile mats to be incorporated with the pine floors. It's looks nice when you walk into the house. I wanted to do this as well in front of the sink. We were talked out of it. They weren't sure it would fit. I should have insisted and I think it would have been fine. I was determined to have that look so I found this pebble mat. This is the wet bar. This space use to be a double closet. Lots of empty space. This is my husband's favorite part of the kitchen. There was shelving but lots of empty space. The pantry door faced towards the hallway of the bathroom. Here is our pantry now. A picture of our island. Drawers slide out with trays that pull out. The drawers close on their own. This is a view of our stove. We love to cook so it's been fun to simmer various things at the same time. Here are where the ingredients get to hang out together. Need to fill these babies up. There is one on either side of the stove. I am more of a fresh herb type of girl. Sorry it's tilted. I'm still working on taking closeups. Four small Celtic Tiles put together in the middle. another coat. Also the border has a Celtic band going all around. Another view of the backsplash. Matted subway tiles everywhere else. I picked out pulls to match the Celtic tiles. Glass knobs for all of the cabinets. Towel bar at the end of the kitchen island. Convenient and right near the sink. Finally we went with wide pine plank floors. They do scratch and ding easily but that's the look we are going for. Here are my final pictures of the kitchen and how it's lived in. Thank you for being patient and I hope you enjoy. ga! your home is GORGEOUS! glad you found my blog, so I could find yours!! of course you can list mine on your blog - I'd be honored. and duxbury, ma is one of my favorite places. you lucky girl, you!! Now that's what I'm talking about. I too adore Something's Gotta Give style and you nailed it my friend with your own special style added in. 8 months of pain sure paid off. That kitchen of yours rocks. I just love when people aren't afraid of glass, it adds such character. I have never seen granite like that before, I swore it was marble and would never have guessed. I too love white marble but also did granite for fear of staining and ended up choosing one my hubs liked which is nothing like white marble LOL! The pebble stone insert sounds so neat, maybe you could share it with us. Your home looks like such a happy cosy place to be and you should be so proud. Thanks for having us in for a visit. I could almost smell the coffee brewing!. Now I've got to go and paint my cabinets white HA! So dying for a white kitchen. Thanks stopping by and thought I would say go to Good Will or Value Village if you have one nearby once a week and quickly scan through instead of going less and staying longer. You will find a steal of a deal more often! That is what worked for me in the past. You've done an absolutely fabulous job! I bet you love it every single time you walk in there! Nice work! What an amazing makeover...it's gorgeous. everything in your kitchen is really lovely. You must smile every time you're in there! The changes you made were amazing! I think the countertops are just gorgeous and I love how you mixed and matched! Thank you so much for joining in on the party and sharing your home! What a beautiful kitchen you have created!! You should be so proud. It truly is magazine worthy! See you at my Blog Hop!! Just stunning...that could definitely be a cover story for Country Living Magazine. We are looking at redoing our cottage kitchen...you are now filed and saved as a go to when we talk to the architect! BEAUTIFUL!!!! Thank you for leaving such beautiful comments. Wow love your kitchen, I love the blue and white so stylish, the layout will be something similiar to mine only I will have a narrower size fridge and a larger window. Thanks for sharing with me. I've added some of your photos to my ideas folder. Sorry it took me so long to comment. Thanks so much for linking this amazing kitchen up this weekend at my link party! Awesome indeed. Thanks for sharing this at Transformations and Treasures!! HOW BIG IS YOUR KITCHEN RUG? WHERE DID YOU GET IT IF YOU DON'T MIND ME ASKING? ALSO THE RUNNER WITH THE BLACK EDGE? IS IT SOMETHING THAT IS EASY TO WIPE UP WITH KIDS? I JUST BOUGHT A TABLE WITH 6 CHAIRS AND WONDERED HOW BIG THE RUG SHOULD BE. much for leaving a sweet comment. The rug is from Crate & Barrel and it's called Biscayne Blue. IT comes in various sizes and colors. It's an outdoor/indoor rug and very easy to clean. I have three little ones! The size is 9X12. I hope this helps and I do apologize for not getting back in a timely manner.